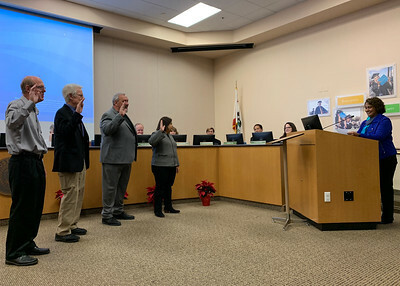 MiraCosta College’s Board of Trustees elected David Broad as president and Rick Cassar as vice president during its regularly scheduled board meeting on December 17, 2018. Broad, who has served the northwest Oceanside community on the board since 2010, ran unopposed during his re-election bid last November. The retired biotech executive holds a doctorate from the University of London and was general manager of Genentech’s Oceanside location. Broad hopes to further the college district’s continuing efforts in increasing the number of students who successfully graduate and transfer to four-year colleges and increase the number of innovative programs offered by the district that lead to living-wage jobs. “The board will continue to maintain the district’s strong financial position and good rainy-day reserves, while continuing to focus on prudent use of its 2016 construction bond funds,” Broad said. Rick Cassar, a college professor, was named vice president during the December meeting. Cassar won re-election to the board in November with 75 percent of the vote. Cassar lives in Cardiff-by-the-Sea and has represented that community on the Board since 2014. Both Broad and Cassar have children who have attended community colleges in California.